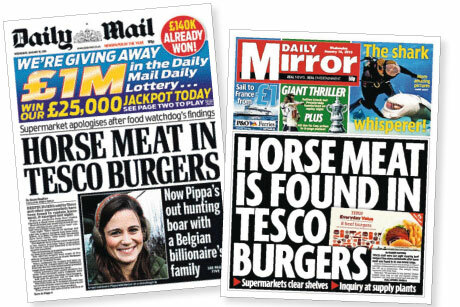 The UK food industry is yet to produce a joint comms strategy to deal with the fallout from the 'horseburger' affair, as investigations continue over how horsemeat ended up in beefburgers on sale in supermarkets. Two weeks after the story that beefburgers had tested positive for samples of horse DNA hit the front pages, the UK’s Food Standards Agency is still in investigation mode. One meat industry source told PRWeek the process of establishing how horsemeat had entered beef burgers ‘has taken longer than anyone would have liked’ but had to be settled before any comms initiative. ‘We’re still trying to understand completely everything that’s happened everywhere,’ the source said. Tesco, which bore the brunt of the negative coverage because one of its burgers was found to contain 29 per cent horsemeat, is planning a fresh wave of communication with customers once the investigations are concluded. English beef and lamb industry body Eblex is acting to gauge the effect on the reputation of beef by commissioning consumer research to measure awareness of the story and the effect on buying decisions. The DNA testing that brought the contamination to light was undertaken by the Food Safety Authority of Ireland. The UK FSA said it would be considering whether to introduce routine DNA testing. It claimed responsibility for leading future efforts to reassure the public, but was not ready to discuss what its plans were. Meanwhile, the firm that owns two of the affected plants, ABP Food Group, announced it was implementing a DNA testing regime ‘over and above any legal requirements’. Eblex has chosen to focus its comms on DNA testing in the hope of putting out a positive story, its comms manager James Wilde told PRWeek. The PR professional at the centre of a Cadbury food scandal said it was vital that firms impacted by the horsemeat scandal responded quickly. However, further comms on the issue may not be in everyone’s interests, Taylor believes. ‘To some extent, further comms at this stage could remind consumers of the incident that’s already taken place. Consumers quite often have a short memory span and more publicity two weeks or three weeks after just reminds them of the event,’ he added. Taylor pointed out that the FSA and Defra may not be able to be as open as they want. ‘These are not organisations that can move very quickly and there will be legal processes in place if there are going to be prosecutions. As there will be the possibility of that, then obviously they have to follow process,’ he said. Irish food ministry claims meat supplied to ABP’s Silvercrest plant in Ireland that tested positive for horse DNA was from Poland. FSA says new tests on ABP’s Dalepak plant in Yorkshire are clear, but investigations continue into the origin of horse DNA detected in some Dalepak products in 2012. Tesco apologises to customers, saying it has withdrawn all products from its affected supplier. Other affected retailers including Aldi, Lidl and Iceland clear their shelves. FSA of Ireland reveals burgers on sale in Ireland and UK, supplied by two plants in Ireland and one in UK, have tested positive for horse DNA.